Jamaica’s picture perfect white sands and azure waters may tempt you to bask in the sun all day, but if you do manage to drag yourself way from the rum punch and the sun-bed, then we urge you to immerse yourself in the breathtaking activities Jamaica has to offer in and around its vast landscapes. There is more excitement and adrenaline on this chilled island than you would ever imagine. For all you intrepid explorers out there, there is no way you can visit this glorious island without spending a day by the Duns River falls. One of the Islands greatest natural attractions, these rocky waterfalls sparkle in the sun dappled forest. Just off Ochos Rios beaches, escape into the jungle and be amazed by the towering smooth boulders and fresh waters crashing over them. You can even take a dip in the refreshing waters whilst the waves gently wash over you. Follow the springs and you’ll watch it trickle down all the way into the Caribbean Sea. We can’t step onto this Caribbean Island without acknowledging the sense of adventure that runs through its heart and soul. We all remember the Iconic Cool Runnings film based on the inspiring Jamaican Bobsled team, which is why we couldn’t resist this little adrenaline fix. Climb up to the Mystic Mountain in your very own chair lift and you’ll find the top attraction in Ochos Rios, if not the whole island. Powered completely by gravity force, strap into your green and yellow bobsled, and take in one last awe inspiring view before you soar through the luscious foliage. With total control of the speed, you can chose to take in the views at whatever pace you fancy. 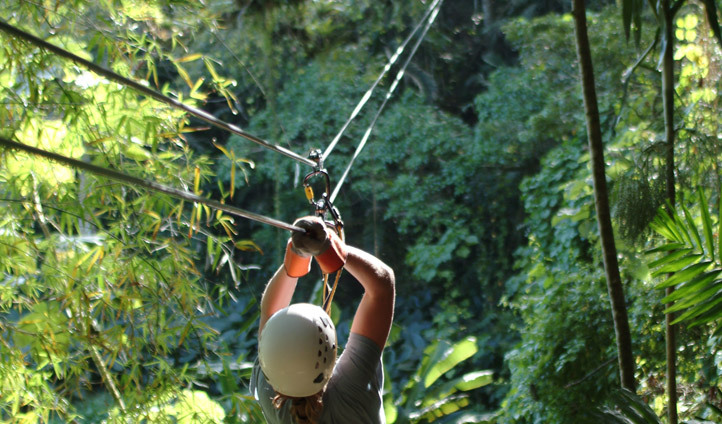 If you’d rather admire the tropical landscapes from above, stay at the top of Mystic Mountain and hook yourself onto the exhilarating Zip wire course. Following your leisurely chairlift ride up, you’ll be keen you gain some speed through the forest. Soaring over natural springs, in-between banana leaves and bowing palms, you’ll get an outstanding view of Ochos Rios and the boundless Caribbean Sea. You’ll be trained up for an hour or so, and then left to enjoy the course at your own pace. Just another great way to enjoy Jamaica’s natural beauty. There are many ways you can get around this beautiful island, but we have a particular favorite – on horseback. Start in the shady stables nestled in the mountains where you’ll greet your four-legged friend before hopping on and descending through Jamaica’s vast landscapes. Trot through plantations, sugar cane fields and luscious jungles before you reach the wondrous Montego Bay. As you and your horse step onto the warm sands, your ride slows a little, allowing you to admire the azure waters twinkling around Half Moon Bay. And it doesn’t stop there, be prepared to wade into the sea on the horses back and effortlessly glide through the water. If you’re looking for something a little more tranquil, there is nothing more peaceful than the Martha Brae River. Take the weight off your feet on your very own bamboo throne, and be punted down the river. The raft will effortlessly glide along the milky blue waters allowing you to take in the sun shaded surroundings and vast botanical beauty. We recommend an afternoon rafting ride after a sunny morning on White Montego Bay, escaping to the temperate tropical shades and peaceful surroundings.